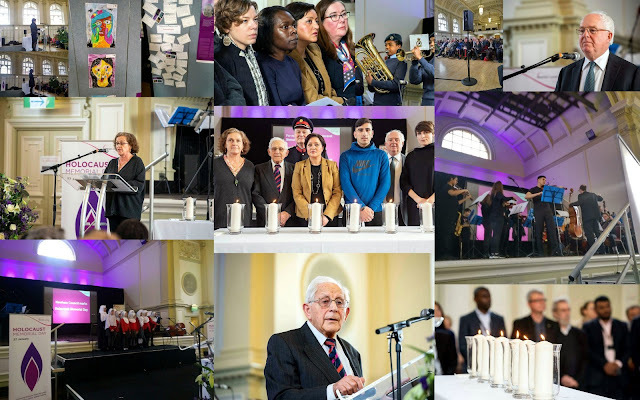 "The candle-lighting ceremony, led by Mayor Rokhsana Fiaz and including Holocaust survivor Harry Olmer BEM, was part of Newham Council’s annual event to mark Holocaust Memorial Day. The theme this year was Torn From Home. Around 400 people, mainly schoolchildren, gathered to reflect on how the loss of a safe place to call home is part of the trauma faced by anyone experiencing persecution and genocide. This included remembering those who suffered and died in the Holocaust and subsequent genocides and refugee crises such as Cambodia, Rwanda, Bosnia, Darfur, Myanmar, Syria, Yemen and Afghanistan. Harry Olmer, 91, was born in Poland. He was 12 when World War II started. During the Nazi persecution of the Jews, he survived the horrors of five labour and concentration camps. He last saw his mother and sisters after he, his brother and father were separated from them in 1942. Mayor Rokhsana Fiaz spoke about how people must never forget the horrors of the Holocaust. She said: “The Holocaust was an unparalleled human tragedy and act of evil. Six million Jewish people were murdered, simply for who they were. At least another five million people – Roma, people with disabilities or held certain political beliefs – were also killed, alongside many others. Millions of people were sent to their deaths because of the perverted, racist ideology of the Nazi era. “As we remember those who suffered and died in the horrors of the Holocaust, we must unite against all forms of hatred and persecution wherever it exists to ensure that an atrocity like the Holocaust never happens again. We all have a responsibility to remember the horrors of the Holocaust – and to pass down that memory to future generations. Newham’s commemoration began with the Quwwat-ul-Islam Girls School Choir performing a song called One Day. The Klezmer Bridging Sounds Orchestra performed Gelem Gelem, an anthem of the Roma people murdered in the Holocaust. The 282 Squadron RAF Cadets Band from East Ham performed Abide With Me. Readings were given by pupils from St Luke’s Primary School, New City Primary School, Essex Primary School, Lathom Junior School, St Stephen’s Primary School, Kingsford Community School and Sir John Heron Primary School. Other speakers included Lady Hannah Lowy Mitchell, a documentary maker and emeritus trustee for Women for Women International and chair of the Lowy Mitchell Foundation, and Lord Parry Mitchell, who chaired the Coexistence Trust, which encouraged dialogue between Jewish and Muslim students on UK university campuses. Six candles were lit in memory of the six million who lost their lives during the Holocaust and other genocides. They were lit by Harry Olmer; Deputy Lieutenant John Barber, the Queen’s Representative in Newham; Adnan Khan, 17, a survivor of persecution in Afghanistan; Leah Lovett, a member of Newham’s Jewish community; Lord Mitchell and Lady Lowy Mitchell.